Overwhelmed with your task-filled life? 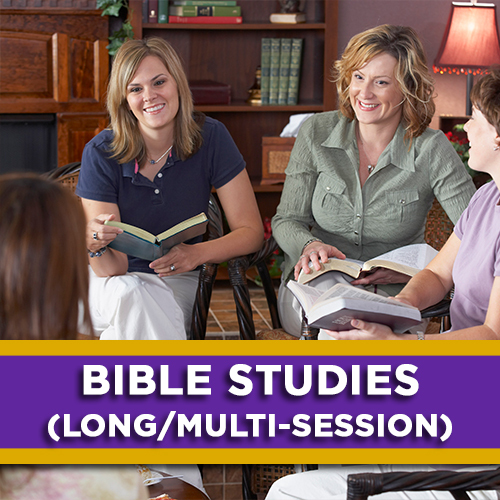 6 main sessions, each followed by 5 short devotional sessions to dig deeper. By Jan Brunette. Read it online here or access a printable version. The conclusion of the Bible study presented to the 2017 LWML Convention included a summary of themes used at LWML national conventions throughout our 75-year history. By Deaconess Betty Knapp. Deals with 14 biblical personalities and examples of times when they lost their focus and when their focus was restored by God. By Rev. John Heckmann. 14 sessions. Every Christian has spiritual gifts. What are yours? Learn about the spiritual gifts of administration, faith, generosity, mercy, prophecy, service, teaching, and wisdom. By Cheryl Mattil. 8 sessions. Designed to help open your eyes to new ways to be a winsome witness of Jesus using your personal photographs and experiences. At the end of the study you will have a Witness Album completed and ready to share. By Diane Grebing. 6 sessions. Based on Jeremiah 29:11–12, presents the question: are you concerned about the future? This study helps us gain insight by replacing the worries of the world with God's truth and reassurance. Discover God's plans for a life of hope, faith, and support in Him. By Donna Pyle. 4 sessions. Based on John 3:16, recounts God's pursuit of us in love. This study offers incredible insight and fresh clarity into one of the most well-loved passages in all of Scripture. Fall in love all over again through the One who first loved us. By Donna Pyle. 4 sessions. Based on 2 Corinthians 3:17–18, helps you discover that just as oxygen gives life to your body, so the Spirit gives life to your soul. Take a deep breath and be refreshed by the very breath of God. By Donna Pyle. 4 sessions. Based on Hebrews 11:1&6, explores the Biblical principles of cultivating and maintaining a strong faith, which proves essential on your spiritual journey. With a strong faith, through the power of the Holy Spirit, you can withstand any famine that you may encounter. By Donna Pyle. 4 sessions. Based on Psalm 95:6–7, explores who we worship and our dedication to worship of the Triune God in our day-to-day lives. God created every person with a need and desire to worship. Unfortunately, some worship false gods or idols, while others worship money, a lifestyle, or even self. By Donna Pyle. 4 sessions. Based on Psalm 139:23–24, looks at the intimate relationship God desires for us. This study will help us come to understand just how much we need God's grace, mercy, and redemption that He so lovingly provides. By Donna Pyle. 4 sessions. Based on Luke 2:8–14, helps you walk through the vivid colors of history to learn how God orchestrated that miraculous night that changed the world forever. Be transported to the shepherding fields near Bethlehem on that starry night. By Donna Pyle. 4 sessions. Based on Matthew 2:2, 10–11. The Magi traveled many miles and months to find Jesus. Journey through this study to discover the wonder, miracle, and majesty of their search — Jesus Christ, the promised Messiah and Savior. By Donna Pyle. 4 sessions. This three-part Bible study and leader’s guide with insights into developing leadership attitudes and skills is ideal for a leadership workshop or Board of Directors’ study. By Rev. John Heckmann.